If the vaping industry has a real underdog, it might be Tobeco. Neither as flashy as SMOK nor as influential as Freemax and Kanger, Tobeco has made a name for itself largely as the original manufacturer of other companies’ vaping products. As is the case in most white label product manufacturing arrangements, Tobeco manufacturers products that other companies then put their logos on before packaging those products for sale. White label manufacturing is a great way to keep a company operating, but it’s not the greatest way to establish a well-known brand. That’s why Tobeco has since begun branching out and manufacturing more products under their own brand name. These days, more people than ever are catching on to the fact that Tobeco produces some really great products. 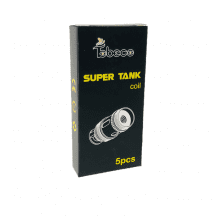 Take the Tobeco Super Tank, for example. Already, the Super Tank is earning rave marks from reviewers for its long-lasting coils and superb flavor reproduction — but it doesn’t stop there. The Super Tank also works with coils from Aspire, Freemax and ELeaf, making it one of the most versatile tanks on the market. You can always find Tobeco coils right here for the best price. We always ship retail orders for free regardless of size, and we always guarantee that we carry nothing but 100 percent authentic coils.